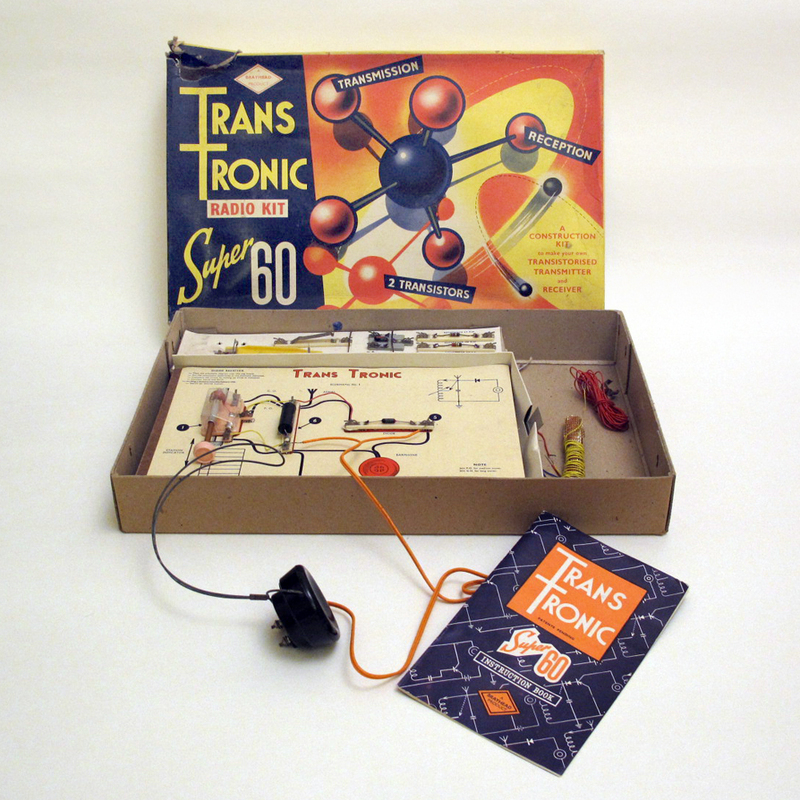 I don’t recall now whether it was for a birthday or for Christmas but I had been hinting for some while that a Triang Trionic radio construction kit would be welcomed by me. For some while I had been intrigued by wires and electricity, no doubt an interest inherited from my father, and I had seen an advert for one of these kits in his monthly copy of “Practical Wireless”. I liked the idea that I’d be able to make my own transistor radio and in the kit were a number of different projects with which to experiment. When Christmas, or whatever occasion arrived, there was a large box wrapped up and I just knew it had to be the gift I had hinted upon; imagine my surprise therefore when I opened it and discovered it wasn’t! Inside was a radio construction kit but the make of which I didn’t recognise from any adverts I had seen; it was a Trans-Tronic kit, with seven radio projects to build and I was delighted even if it wasn’t the one I’d set my heart upon. Within no time at all I had constructed, not the first starter model, but the most complicated one which used nearly all the components and I plugged in the battery, put on the earphone and tuned in. OK, so it was not wonderful, but I could listen to many stations using the sliding tuner. I also discovered that if I put the earphone inside an old loudspeaker horn from the 1920s I’d found in the depths of my grandmother’s garage, I could listen in without having a bent ear from the uncomfortable earpiece. Probably the most interesting project though was the transmitter and I set it up with an enormous copper wire aerial which stretched from my bedroom window, down the back garden to the washing line post. With Dad’s Grundig tape recorder providing the transmitting material I then persuaded the older of the two young boys next door to tune into my radio station. I had set it up so it was easy to find, down on the low end of the medium wave near Radio Luxembourg and after fiddling with the tuner on next door’s radio eventually could just discern my transmission; clearly I needed to do something to improve the signal if I was to provide a radio service for my neighbours. Not that my young neighbour was the slightest bit interested, he just tolerated my latest phase hoping I’d soon get fed up so we could go out and play. I don’t know how or why I should have tried it, but I discovered if I used two batteries instead of one the transmission was greatly improved, would it be good enough though to reach my grandmother’s radio four houses along the street? 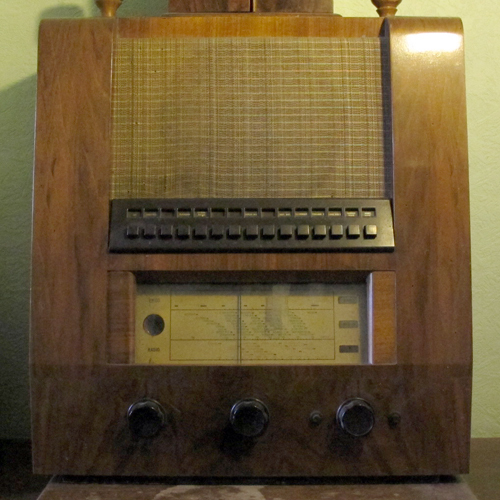 My grandmother had a magnificent radio from the 1940s, one of those with a motorised tuning drive which engaged with a solid clunk when you pushed one of the numerous preset buttons. The motor would kick in with a whir and the needle would move along the scale until it reached the designated stop and the station would burst into life; I was always impressed with this radio. Anyway, could I hear my transmission? Well, just about, it was very feint and I was a little disappointed my grandmother would not have been able to sit in her front room and listen to my radio broadcast. Now I’d like to tell you that I still have the kit, but sadly it just wore out and was lost at the latter part of my teenage years. However, when my father closed up his shop in 1980 he produced another kit exactly the same, why did he buy two I wonder? So I now have a new and unused Trans Tronic radio kit. You might like to know I also still have the radio horn mentioned and also my grandmother’s radio which lives in my lounge. Never had anything like that but I did try to make a telephone from two in cans and a piece of string but my younger sister wasn’t terribly interested in assisting me with the experiment- spoilsport! The whole tin-can-phone experience was a bit of a let-down, probably good for about ten minutes of entertainment but you could always hear what the other person was shouting down the wire without actually putting your ear against it! Glad to hear you got a replacement for your radio kit, bought at the same time as your original. We all dream of re-acquiring toys from our childhood that way – our parents opening a cupboard when we’re adults and showing us duplicates of all the toys we had when we were kids. If only, eh? I seem to have kept a lot of my toys but most are very battered now. The ones that had the most use, the radio kit, meccano and portable record player have all long gone to the great toy heaven! Hello, I was given a Transtronic kit I think at Xmas 1964. I built all the designs including the transmitter, which I only got to work once. Probably a good thing as it was probably illegal! Anyway, it’s long gone unfortunately and I was wondering if any one could send me copies of the circuits. I would really appreciate that. John, Bath UK.